With Google Cast, Are Smart TVs On Their Way Back to Dumb-Dumb Land? Back in July, 2013, when Google introduced Chromecast, I speculated in “Just When TVs Were Getting Smart, Chromecast Will Make Them Dumb Again,” that the little $35 device could overturn years of TV manufacturers’ investments in making TVs “smart.” Flash forward to this week’s formal unveiling of “Google Cast” and the Vizio P-Series with SmartCast, and the vision of TVs heading back to dumb-dumb land could be underway. I'm pleased to present the 292nd edition of the VideoNuze podcast with my weekly partner Colin Dixon of nScreenMedia. Last month Colin and I discussed on our podcast how the connected TV device market is in flux, and this week’s introduction of the TiVO BOLT and the new Chromecast provided yet more evidence of this (not to mention the new Amazon Fire TV and Apple TV). Colin and I are both very impressed with the BOLT and its new features (after we use the review units we’ll have more to share). We agree that the new “SkipMode” feature - which allows viewers to skip an entire commercial break for a set of 20 TV networks during primetime - is the biggest news with BOLT. Beyond BOLT, Google also announced new versions and form-factors for its Chromecast device, which Colin and I have both been big fans since its initial release. Colin reviews Chromecast’s new capabilities, which at $35, makes it an appealing mobile device complement. Stepping back, both of continue to be struck by how all the innovation in connected TV devices is laying the groundwork for SVOD services (which are making investments in long-form programming) to thrive in the living room. I'm pleased to present the 288th edition of the VideoNuze podcast with my weekly partner Colin Dixon of nScreenMedia. This week we return to the connected TV category which we both believe remains in flux. Recent research from Parks showed that Roku maintained its market share lead in 2014, with 34% share, followed by Chromecast with 23%. However, as we explain, there are at least a couple of key variables that could shake up the market’s dynamics. First is that on Sept. 9th Apple will introduce a new Apple TV, which will include a range of new features (though Colin notes 4K appears to be missing). Given Apple’s massive customer base, the new Apple TV will almost certainly gain market share at other devices’ expense. The second variable is if pay-TV operators prioritize integration of major OTT services into their advanced set-top boxes. This would improve the viewer experience by not requiring a change of inputs to access OTT services and in turn would diminish demand for standalone connected TV devices (this is analogous to how integrated DVRs succeeded). However, as I recently wrote, even though OTT integration is a huge opportunity for pay-TV operators, it’s not yet clear they’re embracing it. Apps are everywhere. Apple's tremendous success with the App Store, quickly followed by Google Play and others, popularized a model that has resulted in apps not just on our phones, but also on game consoles, TVs, watches...even in our cars. Yet while native mobile apps (in contrast to browser-based web apps) offer a number of advantages to brands as well as consumers, many developers and device makers seem to think the app model can simply be cloned in other industries with the same success. They are wrong. In fact, I think that our obsession with native apps is holding back widespread OTT adoption - for both brands and consumers. Native Smart TV apps are expensive to build, hard to maintain and represent an investment of time and resources that many content providers are unwilling to tackle. Roku has announced that it has sold over 10 million of its players in the U.S. cumulatively since it shipped its first one in 2008. Roku last reported sales of 8 million units in January '14, which means the company has sold approximately 2 million units year-to-date (Roku has previously said it sold around 3 million units for all of 2013). Roku was an early entrant in what has developed into an intensely competitive connected TV space. Apple, whose Apple TV device was famously referred to as a "hobby" by the company (though no longer) has over 20 million users. Google hasn't released any numbers for Chromecast yet, but undoubtedly its sales are well into the millions also (Google is also launching Android TV). And Amazon launched Fire TV this past spring. The march of content providers into the living room is getting yet another boost as JW Player, whose video solution is used by thousands of content providers, will support Chromecast. JW Player's CEO Dave Otten and creator Jeroen Wijering told me yesterday that the beta is underway with 5 different content providers implementing JW Player with Chromecast support, which will go live over the next several weeks. JW Player will support VAST-compliant advertising, so that video ads will be viewable on TVs when playing through Chromecast. As this demo video shows, JW Player has also enhanced its ad implementation by enabling companion banners to appear on the device driving the Chromecast, so users can engage with the advertiser as their video ad plays on the big screen. 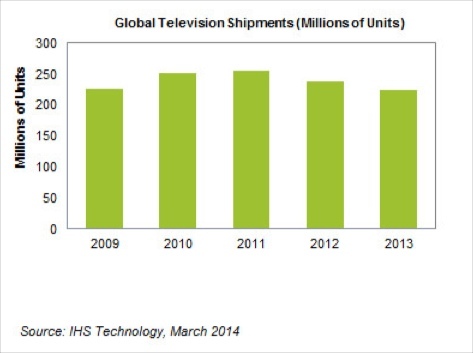 These are highly uncertain times for global TV manufacturers. As IHS reported last week, sales of TVs declined by 6% in 2013 to 225.1 million units, following a 7% contraction in 2012, creating first ever back-to-back down years for the global TV industry. IHS pinned the blame for the declines mainly on market saturation and difficult economic times. To rebound from the doldrums, TV manufacturers are betting heavily on consumers upgrading to 4K TV and Smart TVs. 4K, or Ultra-High Definition TV, has significant challenges with content availability, price and picture quality differentiation it must overcome to go mainstream. Meanwhile, although the price premium for Smart TVs has shrunk, bringing them closer to conventional HDTVs, their value proposition is still not widely understood by consumers and access to online content is still very limited. In this already difficult climate, another challenge for TV manufacturers is now taking shape from a whole new category of devices: low cost streaming sticks. When Google drops $3.2 billion in cash on an acquisition, as it did yesterday with Nest Labs, maker of the Nest self-learning thermostat, you know there are some big, long-term visions playing in the background. Most of the reviews I've read involve the companies capitalizing on the still nascent "Internet of things," where all devices are intelligently connected, exchanging valuable information that improves our lives. Even though Google and Nest were pretty vague in their joint announcement, I more or less buy into this rationale for the acquisition. But, looking at the deal through my video-centric prism, I can also see some interesting possibilities coming from a tight integration between Nest and Chromecast, Google's hot-selling connected TV device. Perhaps the biggest sleeper hit of 2013 was Google's Chromecast. Launched cautiously and with little fanfare, momentum built in Q4 with a slew of new apps integrating the 'casting' feature. Since its launch, it has been the top-selling electronics item on Amazon. Not surprisingly, Google has big plans for Chromecast in 2014, including the debut of its software development kit (SDK) along with an aggressive international expansion, both certain to broaden consumer adoption. Chromecast's big difference vs. all other connected TV devices is that it is almost 100% dependent on mobile devices in order to deliver its full value proposition to consumers (of course Chromecast would still work if you only had a computer using the Chrome browser, but it would far less appealing). In other words, Chromecast isn't just another connected TV device for viewing Netflix, Hulu and other OTT content on the TV, rather, it's more of a platform for bringing mobile's capabilities into the living room. Last Thursday I wrote about how the various connected TV devices are jostling for content deals, creating headaches for content providers and confusion for buyers. Following up that post, yesterday I highlighted holiday deals on Smart TVs which themselves are competing for attention with connected TV devices. Now, to put a capstone on the discussion, I'm pleased to share a handy infographic that the good folks at Shelby.tv have created, comparing and contrasting 4 of the hottest and most affordable connected TV devices, Apple TV ($99), Chromecast ($35), Roku 3 ($100) and Roku LT ($50). The infographic summarizes key features of each, what content is available (with a nice Venn diagram showing overlaps), capabilities to watch from mobile devices and the web, key drawbacks to each, and which might be most appropriate as a gift this season. As online video adoption and longer-form viewing have grown, consumers have become increasingly interested in moving the experience to their TVs. This trend has certainly helped to drive interest in connected TV devices (e.g. Apple TV, Roku, Chromecast, etc.). But even as these devices have proliferated, TV manufacturers have promoted Smart TVs, which connect to the Internet and generally offer a handful of pre-integrated apps, most prominently Netflix, Hulu Plus, YouTube, Pandora and others. Since connected TV devices are relatively cheap (Chromecast set a new low in 2013 at $35) and are easy to install, no longer must consumers be required to buy a whole new TV simply because they want to stream Netflix, for example. No doubt, this dynamic - combined with the saturation of HDTVs and the adoption of mobile devices for viewing video - all contribute to global TV sales being down in 2013 for the second year in a row, the first time this has ever happened. I'm pleased to present the 207th edition of the VideoNuze podcast with my weekly partner Colin Dixon of nScreenMedia. This week we first discuss the prospects of a nationwide "virtual pay-TV operator" launching in 2014, as Viacom's CEO Philippe Dauman asserted will happen, in his remarks at the UBS conference earlier this week. Colin and I agree that if this were to happen, Verizon is the most likely candidate. Of note, the company has recently made 2 acquisitions (of upLynk and EdgeCast), through its Verizon Digital Media Services group, that could be very strategic in a virtual pay-TV operator play. Next we turn our attention to how fragmentation among connected TV devices is causing headaches for content providers and consumers, which I wrote about yesterday. Colin contrasts today's devices with buying a TV, noting how ridiculous it would be if some brands could access certain TV networks, and other brands accessing different ones. The TV industry would never have scaled in that case. This holiday season, connected TV devices are among the hottest items on consumers' wish lists. For content providers eager for a foothold in the "digital living room," surging demand is very good news. The bad news, however, is that due to fragmentation and proprietary approaches among devices, content providers are forced to allocate their scarce resources in a one-by-one development model. This is highly inefficient for content providers and sharply contrasts with how the web's standards helped to drive massive scale years ago. Beyond the inefficiency for content providers, the resulting fragmentation of content availability undermines the scale required for successful video advertising and also creates confusion among consumers about which device to buy. Unlike the web where you can bring home a computer and get access to ALL content, when you get a device you only get a narrower subsection. Today I'm pleased to introduce the newest VideoNuze contributor, Jose Alvear, who is a research analyst specializing in the pay-TV and online video industries. Jose has authored research reports on content delivery networks, IPTV, OTT video, cloud-based TV and social TV for leading firms in the industry. Jose is currently working on a book focusing on the disruption of the TV industry. Researcher IHS released survey results earlier this week suggesting a muted forecast for Smart TVs amid rising consumer price sensitivity and a proliferation of inexpensive connected TV devices. IHS found that 73% of U.S. consumers are not interested in buying a Smart TV in the next 12 months. IHS said that once consumers are educated about Smart TVs and learn more about their features, interest does increase. Overall awareness of Smart TVs is high, at 86%, with 30% expressing purchase intent over the next 12 months. But how intent translates into actual purchase is always tenuous and in this case, particularly so. That's because IHS also found that price has now vaulted to the top position as a driver for TV purchases, surpassing "screen size," which had been cited by more than 50% of respondents in 2012. Early Chromecast owners appear to be integrating the device into their lives, with almost a third or more of them using it daily or almost daily, according to a survey conducted by research firm Parks Associates. Not surprisingly, using Chromecast to watch video on TV is most popular on a daily/almost daily basis (38%). But right behind is "displaying web pages on your TV" (36%), followed by "listening to online music through your TV" (32%). YouTube was the most-used video source on a daily/almost daily basis (49%) followed by Netflix (47%), Hulu (38%), other video web sites (36%), HBO GO (30%) and Amazon Instant Video (30%). Note that all but the YouTube and Netflix usage must be happening by "tab casting" from the Chrome browser, since none of these video sources have yet integrated Chromecast's "casting" feature (the survey was taken in August, before Hulu Plus integrated casting). Mobile is emerging as the locus of innovation in the video user experience, with yesterday's unveiling of the new Yahoo Screen app as the latest evidence. Content providers appear to have realized that the tablet, in particular, offers a new navigation canvas that enables elegant design and graphics with intuitive touch-based interactivity. Combined, the user can be immersed in content to an unprecedented level. I'm pleased to present the 193rd edition of the VideoNuze podcast with my weekly partner Colin Dixon of nScreenMedia. This week Colin and I discuss our experiences with Chromecast, adding details to our respective previous posts (here and here), as well as our initial podcast from a few weeks ago just after the device was announced. Overall, we're both very positive about Chromecast. Among other things, we like the easy set-up, the "tab-casting" feature, and of course, the low price of $35. We both believe it is hugely strategic for YouTube and other video providers who are outside the pay-TV universe to gain access to the living room. Colin has had a few issues with Netflix crashing his Nexus 4 when trying to use Chromecast (though when it has worked the quality has been strong) and he has had trouble using Chromecast's capability of turning the TV on and off. I haven't had any problems using Netflix, though the streaming quality feels slightly lower than when I watch on my iPad or via my connected Blu-ray player. I did have problems with Chromecast when trying to watch golf and suspect it would be difficult to watch faster-action sports. Still, we're both impressed and believe Google deserves lots of credit. We're both expecting big things from Chromecast this holiday season. On a closing note, we'd like to thank all of you for listening to our weekly podcasts. It's been an incredibly busy summer for online video and we both believe the best is yet to come. For those of you with a long Labor Day weekend ahead, enjoy, and we'll see you in September!